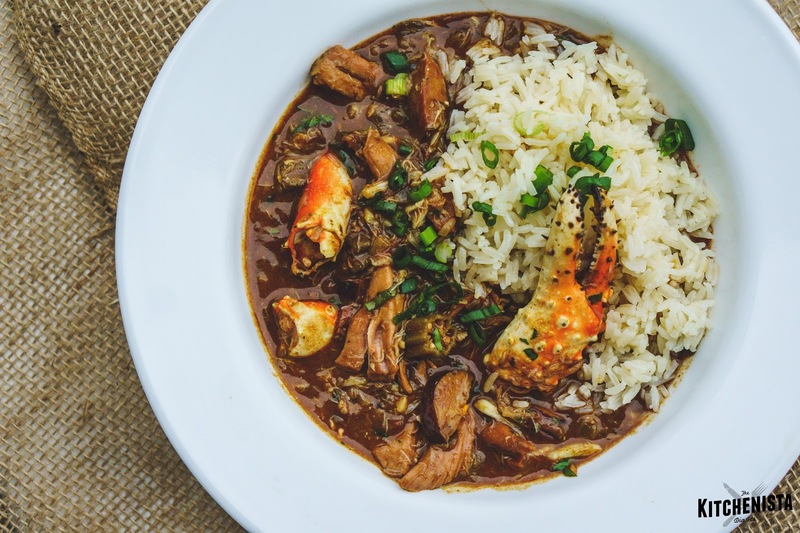 Learning how to cook gumbo was an exercise in pushing beyond my comfort zone. 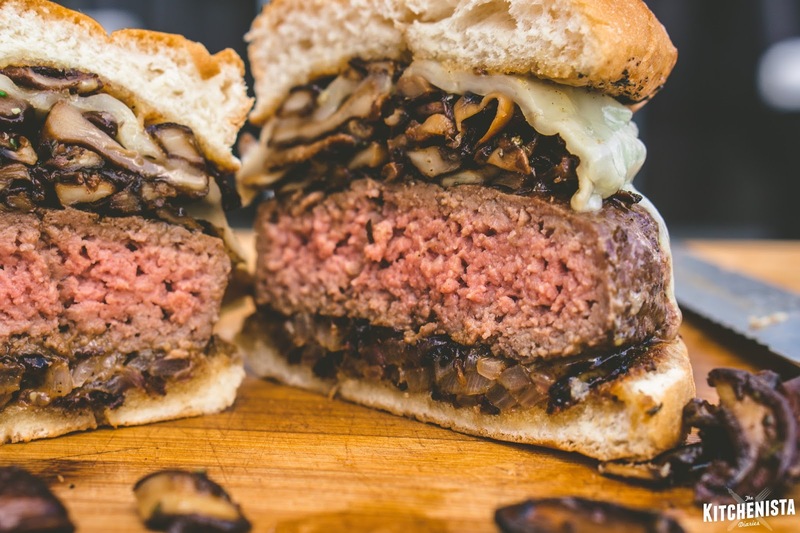 In all my years as a food blogger, the fear of getting flamed online had been enough to pass on that kind of social media experiment. (You do not want to be the person who posted a pic of fraudulent looking gumbo. The entire state of Louisiana will enter your Twitter mentions.) Nevertheless, gumbo has remained on my culinary bucket list. Enamored by its rich culinary history and intrigued by the technical challenge, I knew it was a dish that I would eventually be determined to take on. I guess that's why turkey gumbo was the first thing that popped into my head while brainstorming Friendsgiving recipes this year. Still, I suppose only a crazy person would decide to get their feet wet by cooking gumbo for a hundred people. Wait, what? Yup. In the photo above, that's me in the back, plating salads for a hundred dinner guests. You're probably wondering how I ended up in this situation. 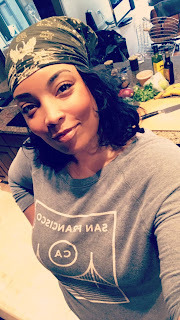 A little less than a year ago, I created the #KitchenistaSundays hashtag to share my Sunday dinner cooking activities on Twitter. It evolved into a roll call for home cooks of all backgrounds to share their own menus each Sunday. As the movement grew, more of my followers joined in, all finding inspiration from one another's meals. 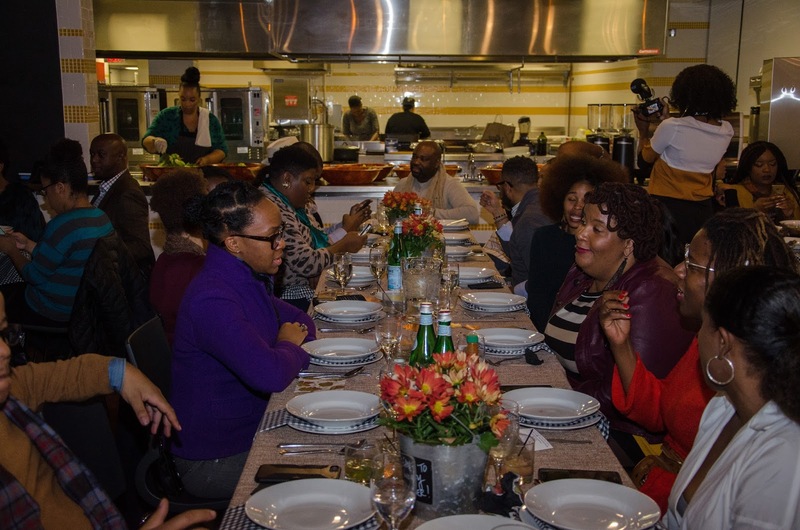 I was even inspired to host a couple private #KitchenistaSundays dinner parties. Towards the end of the summer, I entered into a partnership with Events DC, which you'll be hearing all about in the coming months. 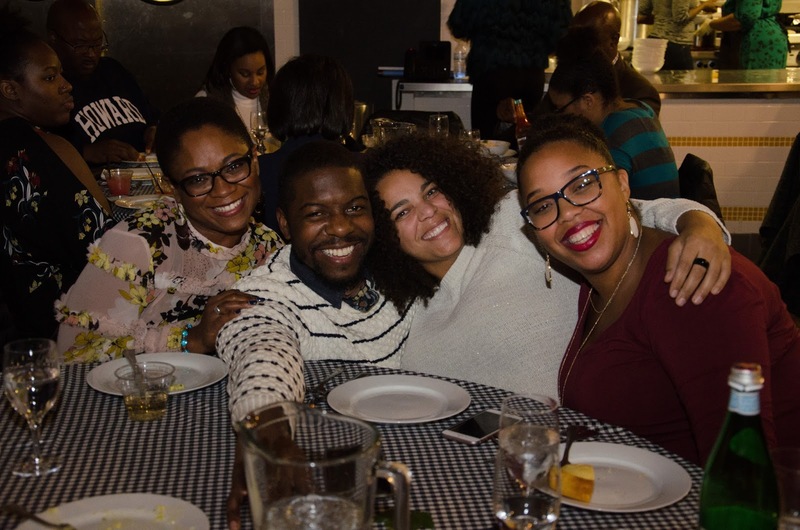 It's an awesome opportunity that afforded me the ability to host three ticketed #KitchenistaSundays events this fall at one of Events DC's facilities, Gateway DC. 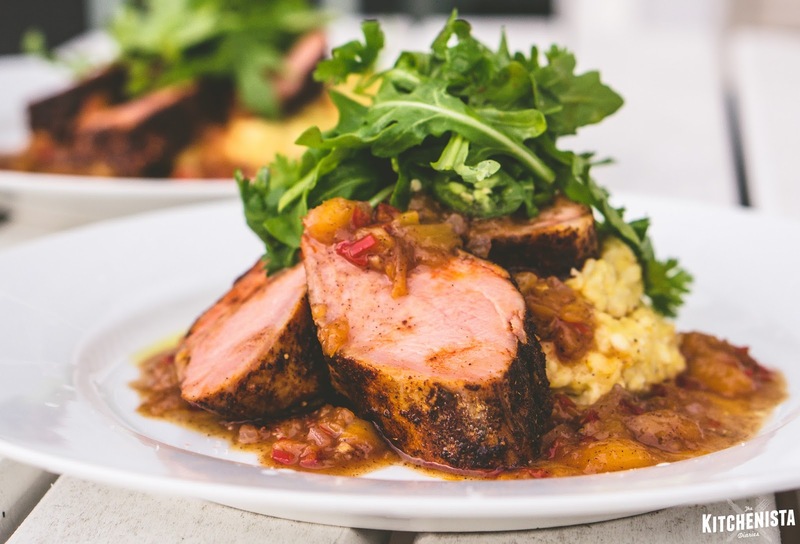 The first time I walked into the space and saw a shiny new commercial kitchen overlooking a huge dining room, it felt like being introduced to my new home. I didn't know it at the time, but things were about to get crazy! After contracts were signed, I had three weeks to plan, promote and execute a public event for sixty guests. Sunday Dinner with The Kitchenista was born. Despite my stress levels, the first dinner went remarkably well, even landing in a local newspaper and a great write-up in Black Enterprise! I immediately moved on to planning November's event, which brings us to how I ended up cooking gumbo for a hundred people. For the Friendsgiving edition of Sunday Dinner with The Kitchenista, I was dead set on serving turkey gumbo. It didn't even occur to me that I hadn't actually made gumbo before and thus had no idea how long it would take, what equipment I would need, or how much it would cost. In the catering world this spells disaster, but there's nothing you can do to change my mind once it's made up about certain things. If I pulled this off it would be a phenomenal personal achievement. If I didn't, I'd go down in flames. Good times. As with any new dish I'm preparing to take on, I did my research first. 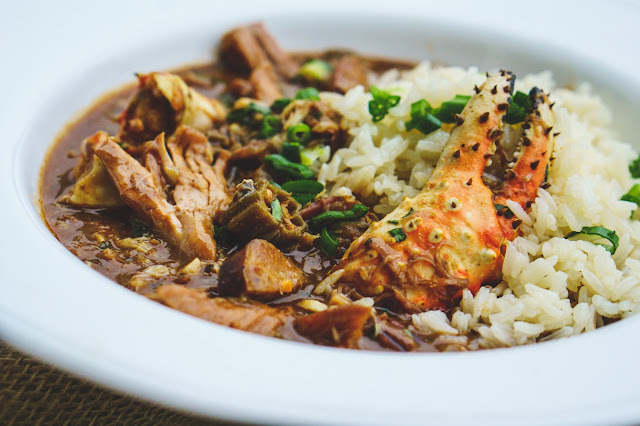 A simple google search for "how to cook gumbo for 100" yielded what seemed like some pretty solid proportions that helped me control my catering costs, and "leftover turkey gumbo" confirmed my instincts on the flavor profile I was after, with crab in place of shrimp. (In hindsight, seafood proved to be a challenging catering cost and I would probably stick to poultry and andouille for a crowd of this size in the future.) 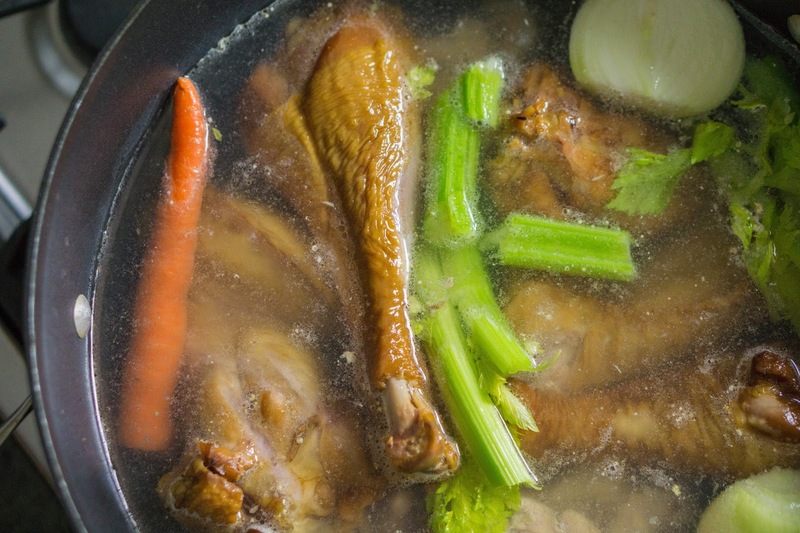 I felt comfortable with the general process of making stock and then a braised poultry stew. 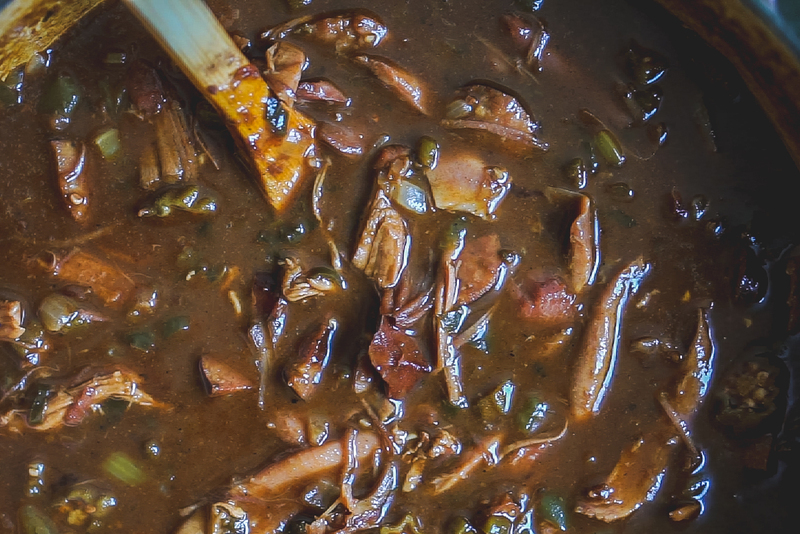 While it was easy to get fresh turkeys this time of year, I love the flavor of smoked turkey and decided my version of gumbo would include both for depth of flavor. I had just missed out on the availability of fresh okra from the farm, but frozen okra would work just fine. This so far seemed like it was going to be manageable. The elusive dark roux, conquered at home for the first time. What I didn't have a whole lot of practice doing was taking a roux past the stages necessary for bechamel sauce or gravy. 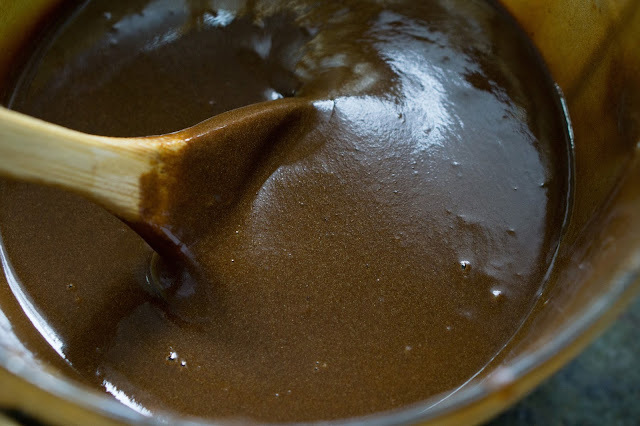 The Story of Rox's Roux provided a great visual reference and instructions on successfully turning flour and oil into the chocolatey colored dark roux that would be necessary to thicken gumbo and create an authentic flavor. 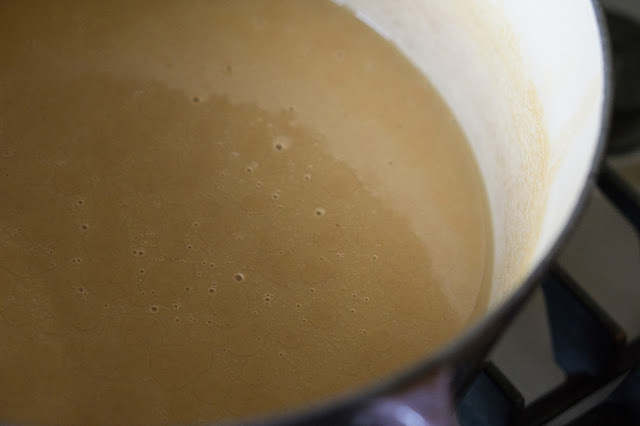 Adapting the recipe to cook a large batch of roux in the oven, as I'd always read was a great hands-off solution, turned out to be a massive waste of time. My second and third batches making dark roux the traditional way, with constant stirring, were easier to control. The biggest takeaway was that it is totally worth it to spend an evening making more roux than you really need. It keeps well in mason jars, and then you don't have to stress over it on the same day you are actually cooking the gumbo. 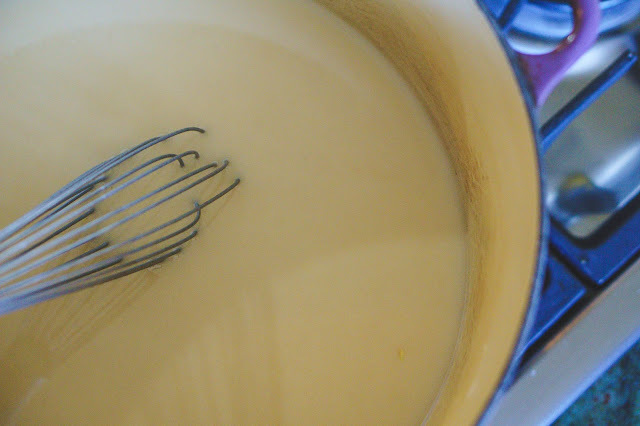 Making a roux takes time, patience, a watchful eye, and a little bit of bravery. I knew what to expect going just past the blonde roux stage, but beyond that, I was in unfamiliar territory. Making a dark roux felt a little dangerous, but in my world that's an exciting kind of danger. Knowing how far to push it, when to stop, and when to pull back is a dance of sorts and the kind of romantic process I lose myself in when cooking. Finding the sweet spot between something tasting of deeply toasted flour or burnt oil is mostly instinctual, no matter how many photos of the stages of roux you study. 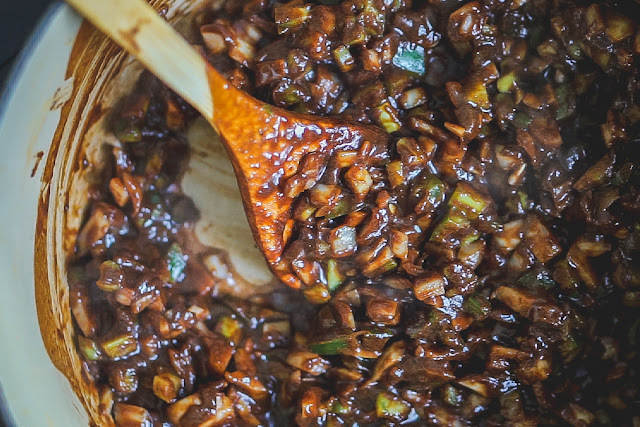 I'd encourage you to read through the recipe ahead of time, but also just be prepared to use all your senses when you actually get down to making the gumbo. 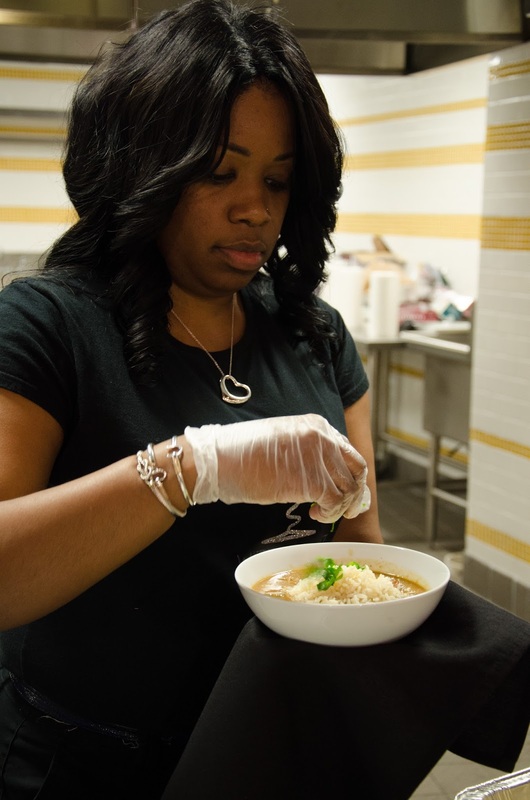 Ayanna from With a Twist Mixologists, jumping in to help garnish on the gumbo assembly line! My gumbo testing went really well! The final version tasted better than I'd ever imagined and left me feeling confident enough to move forward with my Friendsgiving menu. Preparing the gumbo was a three day process, starting with making the roux on day one. With the help of two prep cooks, we started the gumbo the night before the event. We used one fresh whole turkey and two smoked whole turkeys, plus additional fresh thighs. Because this obviously wasn't going to fit in my pots from home, we had to rent commercial pots big enough to fit everything. However, I overlooked the need for a longer spoon. Yikes. I ended up grabbing my long wooden French rolling pin which I'd brought to make pies, and it turned out to be just long enough to stir all that gumbo! Our second major hurdle came after receiving the rented dishes for dinner and realizing the "16 ounce" soup bowl I'd ordered was entirely too small to serve gumbo. It was an expensive mistake on my part, but luckily the rental company still had enough time to deliver a new order. The next day, we adjusted seasonings, let the meat finish braising and added crab just before serving. Plating one hundred servings became a lengthy assembly process but we worked it out with the help of our service staff. Those are the kind of unexpected hiccups I've come across managing events of this size, but each one is an opportunity to learn how to plan out my schedule and equipment better for the next time. 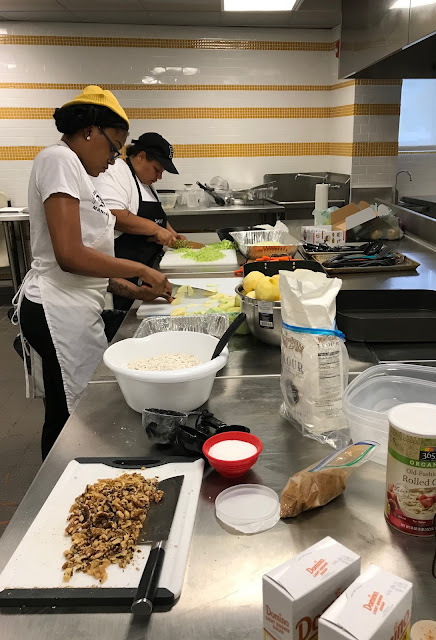 My prep cooks, Taulora and Louisa, hard at work! Luckily, you probably won't ever need to prepare enough gumbo to feed an army. My recipe has been scaled back down to feed ten to twelve, which is enough for a holiday gathering in our house. I didn't know when I would ever have time to actually post this, but now that all three events are behind me I am happy to finally get it up on the blog. I must have been feeling especially ambitious on this particular day because I also captured video footage! Check out my YouTube tutorial here, which I think makes it easy to understand the general process. 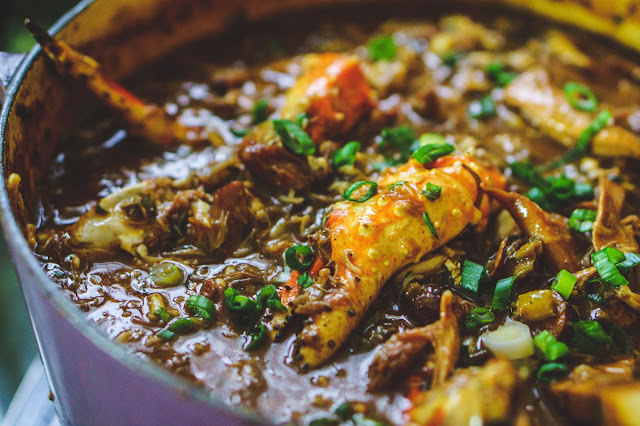 Whether you split this out over a couple days or do it all in one, it's not as impossible as some folks would have you believing gumbo is to make. The key is to be organized, take your time, and feel your way through the process. Don't forget to have fun cooking! 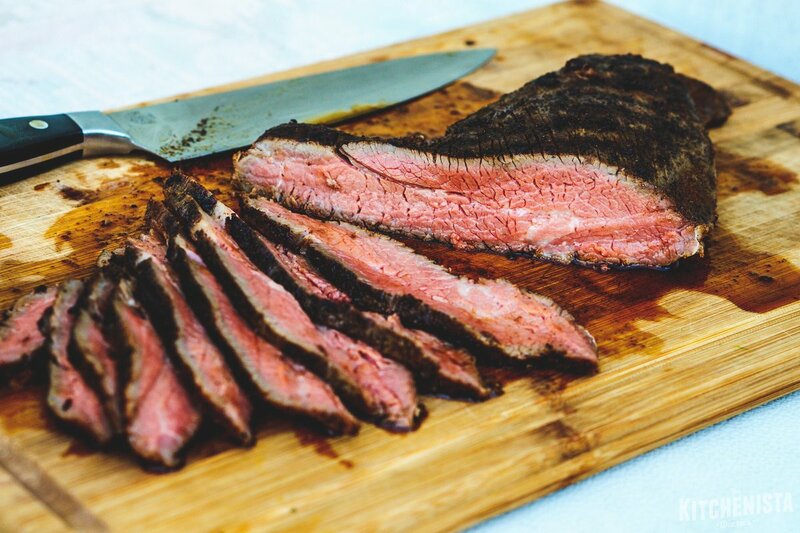 *You can find my cajun rub recipe here. Feel free to use your own favorite seasoning blend if you have something in the pantry already. If it contains salt, be sure not to add too much additional salt to your recipe. Use store bought chicken stock or homemade stock already on hand. 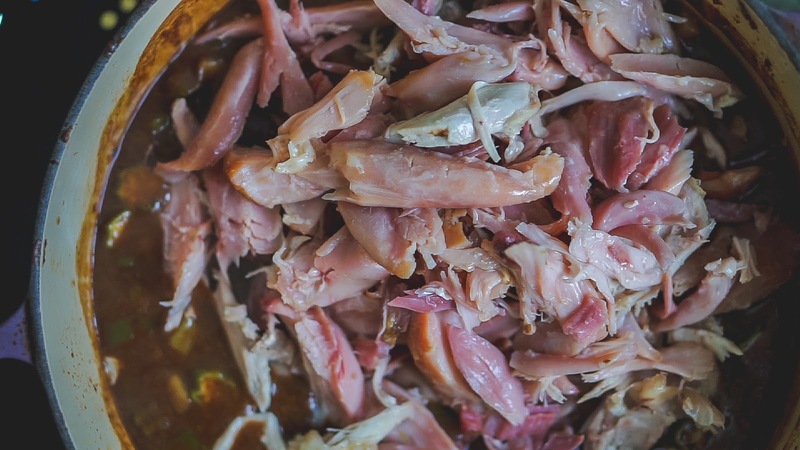 Bring it up to a boil in a stock pot, then add the fresh turkey thighs and smoked turkey parts. Reduce the heat down to low. Simmer for about 30 minutes or until the fresh turkey is cooked through (165°F.) Remove the meat from the pot and set aside until cool enough to handle. It won't be falling off the bone tender yet, but it should be easy enough to cut the bones out. Because the smoked turkey was already cooked, that should be easier to pull off the bones. Set the meat aside and return the bones to the stock pot. Simmer for another hour or so, which gives you time to get the rest of the gumbo ingredients prepped and started in your other pot. Before using, strain the stock, but keep it warm. 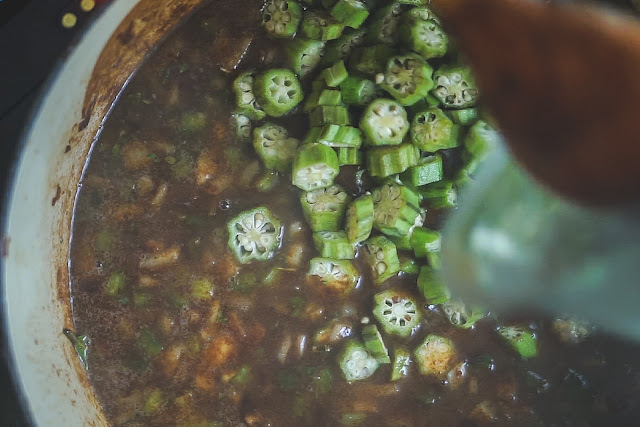 Side note: If you want to make a fresh batch of homemade stock as part of your gumbo process, just tweak the steps above a bit. You'll start with water and the other stock ingredients (onions, celery, carrots, herbs, etc) along with the 4 pounds of turkey meat called for in this recipe. For best flavor add additional bones (chicken or turkey is fine) and simmer several hours before using. Just remember to pull the meat out after it has reached 165°F, otherwise it will be too overcooked to use in the gumbo. 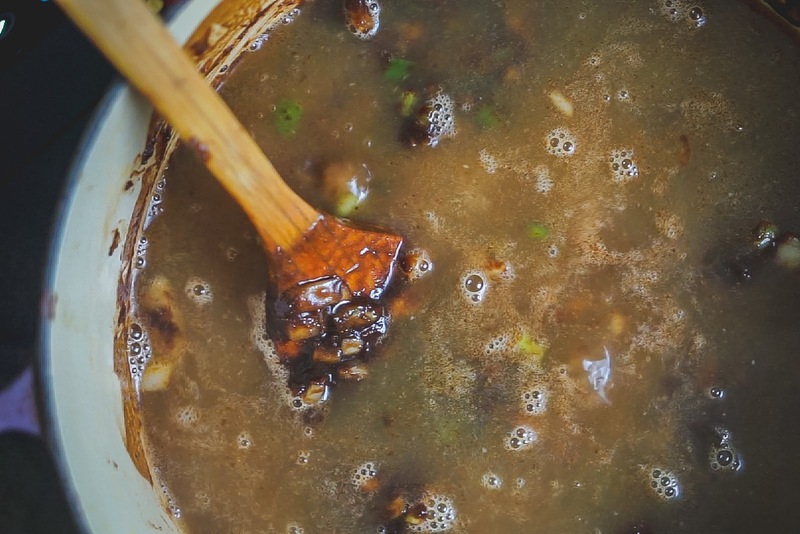 The dark roux can be doubled, tripled, quadrupled, etc, with the excess stored in the fridge or freezer for a future gumbo. It will take longer to make as the quantity increases. The batch I needed for my event took a couple hours to make and started out with twelve cups each of flour and oil! The first stage should look familiar if you've used a flour roux to thicken sauces. In your Dutch oven pot, whisk together the flour and oil over medium low heat. 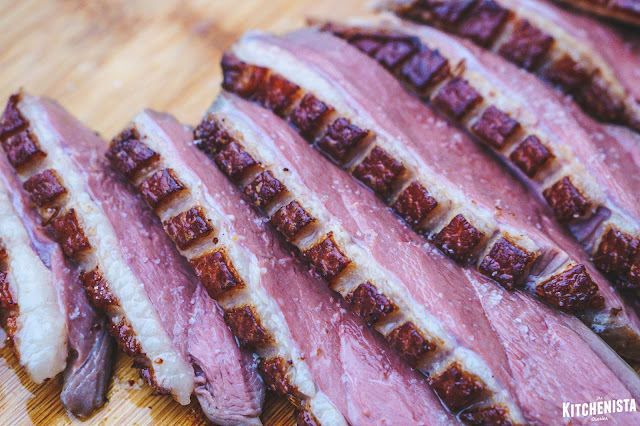 After a couple minutes you'll have a white roux that should be smooth and pale in color. This is where you'd stop for the bechamel sauce used in mac & cheese, as an example. The roux will be at its strongest thickening power at this state. As it darkens, what it loses as a thickener it will gain in flavor, which is actually more important in gumbo. The safest way to go forward is to turn the heat down to low. Switching to a wooden spoon and stirring periodically, cook the roux for several more minutes until the color darkens to a golden hue. 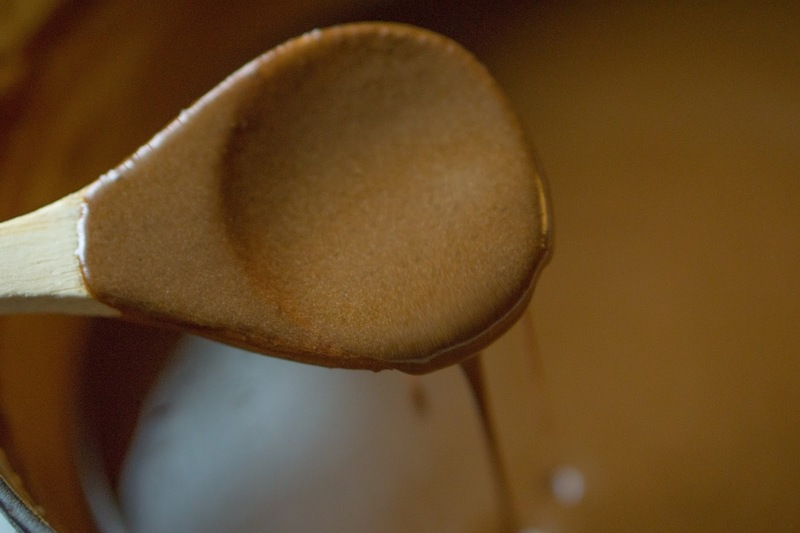 You'll reach a blonde roux, which would be great for sauces like chicken or turkey gravy. 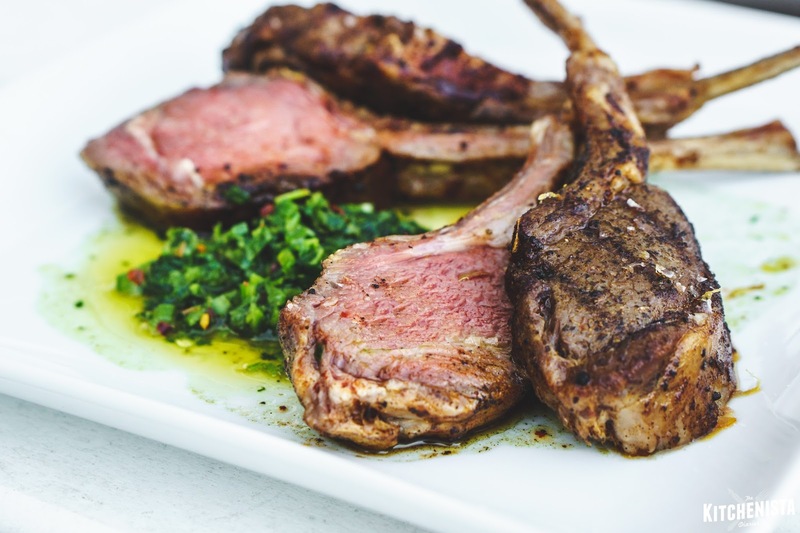 The roux will start to smell more toasty as you proceed. 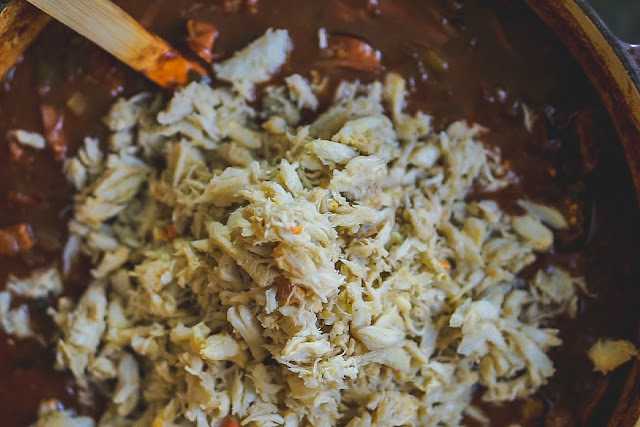 After about thirty minutes you'll get a brown roux, which tends to be the beginning of the spectrum for a lot of cajun and creole recipes. This is where it can get dicey. 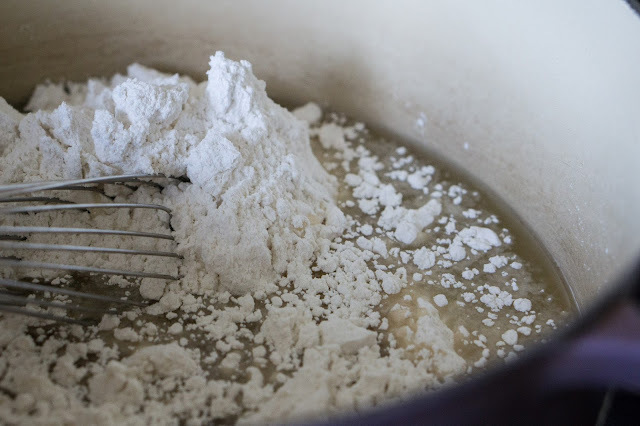 If the roux starts to clump at the bottom of the pot and flecks of flour brown too fast, you risk things starting to take on a burnt flavor and ruining the whole batch. So keep it moving, and if you need to occasionally get back in there with the whisk by all means do so. I don't recommend trying to speed this process up on higher heat unless you're absolutely comfortable and not going to step away from the stovetop until it's done. You could theoretically stop here for your gumbo, but if you're like me, you're prepared to take the risks and reap the rewards. Keep stirring frequently, until the roux goes well past the red tint of a copper penny, then beyond a pecan brown. It's going to start smelling like you're on the verge of burning something, but in a good way if that makes sense. You'll want to stir constantly at this point so be careful of splatters. 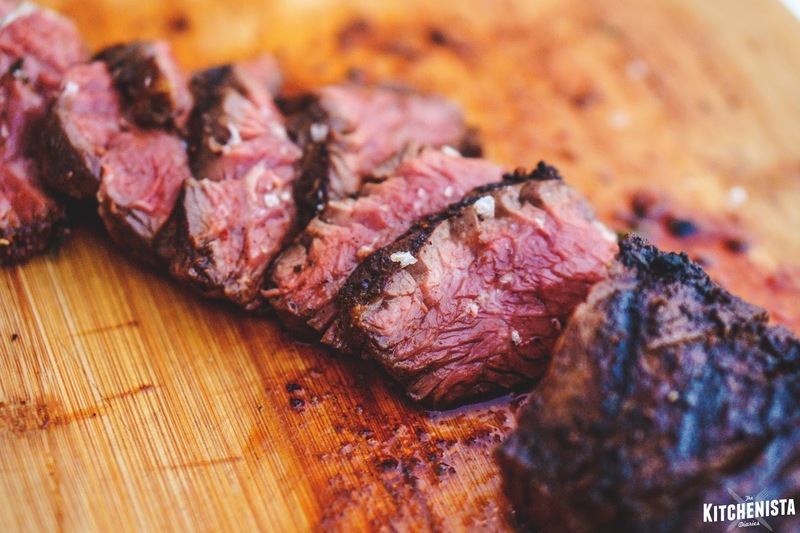 While it may start to look like silky melted dark chocolate, remember this is piping hot oil. Move the pot off the stovetop if you've made a larger batch and need to let it cool. 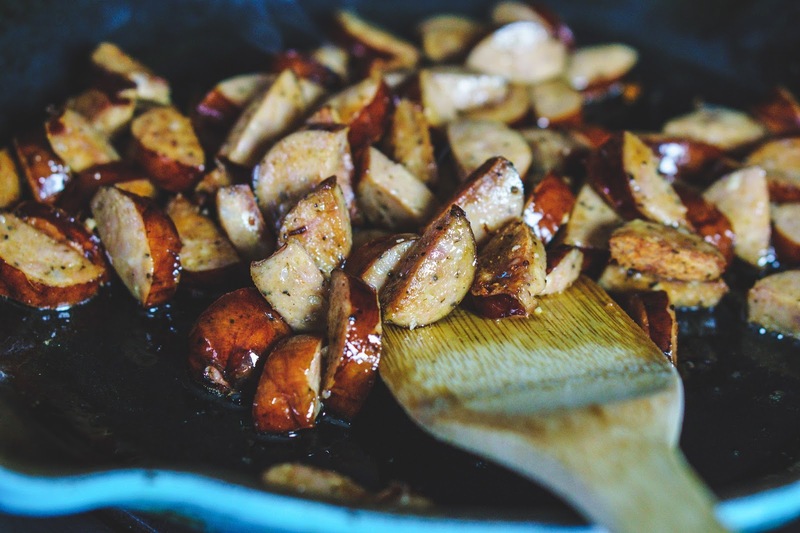 Because it will continue to cook, you do still need to stir frequently, and you'll find that the color will darken a bit more. Once it's cooled to room temperature you can transfer to jars or freezer safe containers. The flour will settle after awhile and the whole thing will harden once cold, so let it come to room temperature and stir before using. 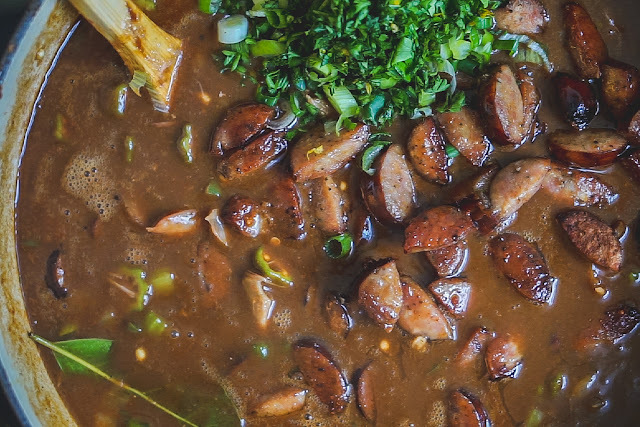 If you've only made exactly enough roux for one batch of gumbo, you can continue on with the recipe, below. In a separate skillet or if your Dutch oven pot has been cleaned out, brown the andouille sausage and set aside. Before assembling the gumbo, you should already have your stock hot and cooked turkey meat set aside. Your trinity (the onions, celery and green pepper) along with the garlic, herbs, spices and okra should be prepped. If you haven't already done so, return 1 1/2 cups of dark roux to the Dutch oven pot and gently warm it while stirring constantly over medium high heat. Do not let it turn black. Add the diced onions, celery and green pepper. This will immediately cool down the roux and prevent it from burning too fast, but continue to stir it frequently as the veggies soften. Add the garlic and Cajun spice blend. Stir for another minute, then ladle in about ten cups of strained stock. Scrape up the bottom of the pot to loosen any browned bits. Bring the liquid up to a gentle boil, then reduce heat to simmer. Stir in the bay leaf and thyme. Within a minute or two the stock will begin to thicken considerably. 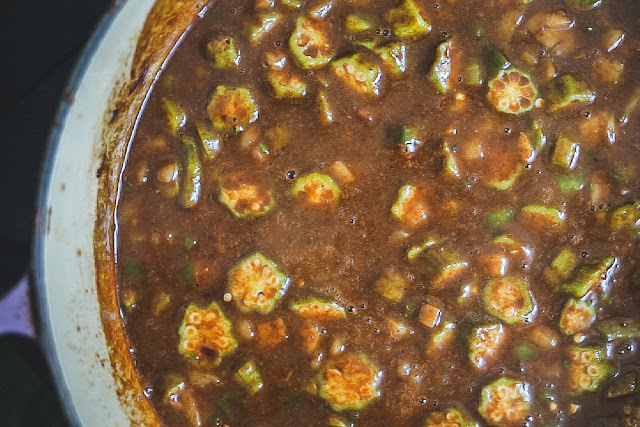 The okra actually does most of the work to thicken this gumbo, not the roux! Add the pulled turkey meat that was set aside earlier. Season to taste with salt, as needed. I tend to wait towards the end to fine tweak seasonings as some of the other ingredients will also contribute salt. Next, add the andouille, half of your minced parsley and half the scallions. Add Worcestershire sauce, vinegar and a splash of hot sauce. Stir it all up and let the gumbo simmer on low heat for an hour or so, until the turkey is tender enough to shred easily. I kept the pot covered with the lid slightly ajar. If the gumbo is too thick for your taste, you can add a little more stock to loosen it. If it's not quite thick enough, offer gumbo filé powder at the table to let guests thicken their own bowl as desired. It adds a little bit of a distinct flavor as well. Picked crab meat is already cooked so make sure the rice is ready and anything else you're serving. I'd suggest some skillet cornbread! It's not going to hurt the gumbo to simmer a bit longer if you need to make other side dishes. It's also fine to stop here, let the gumbo base cool and then refrigerate until the next day. When adding the picked crab, also add accumulated juices. If you wanted to use crab legs in addition to or instead of picked crab, that works too. I added crab legs for the version I made here. The legs added more flavor but I think it's easier to eat gumbo without all the shells, so that's the route I took for my event. Finish the gumbo with the remaining parsley. Garnish with scallions when serving! This year has been my first full year as a freelance chef, food blogger and recipe developer. It was my first year hosting public dinner events, and my first partnership with a company as big and as reputable as Events DC. I took a lot of a calculated risks, and they paid off. The thing about trying anything new is that you have to be okay with the possibility of screwing it all up. It's what allows you to get to new places. I started out just wanting to make gumbo, in much the same way that I just wanted to host a big Sunday dinner party. What I ended up experiencing was something more transformative. Over the past three months, I really challenged myself as a cook and business owner and ended up creating something I'm excited to continue improving and perfecting. I'm no expert on cajun cooking anymore than I would dare call myself a seasoned event planner. It took blood, sweat and tears to overcome some major obstacles along the way. 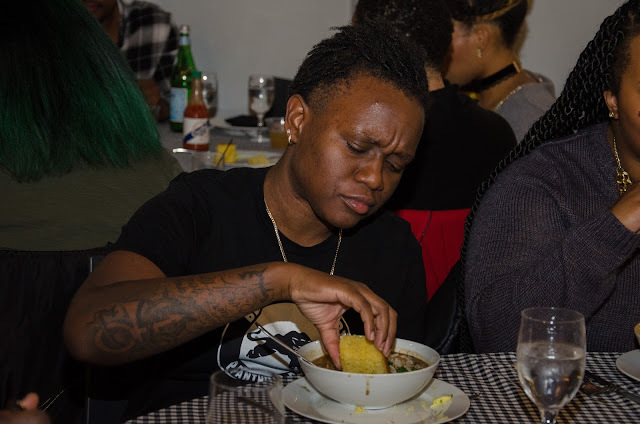 But with a little bit of determination and a lot of courage, I learned how to make a damn good bowl of gumbo while carving out a unique space in DC for people to bond over Sunday dinner. 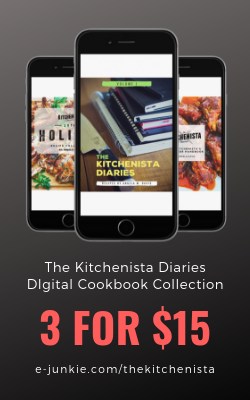 For updates on future #KitchenistaSundays events, please be sure to join my mailing list. I'll also post ticket sale information here on the blog when released. Events in DC are typically on the third Sunday of the month. We expect to resume with the next dinner in February 2018.